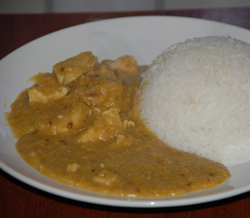 A beautiful full flavoured curry, made with chicken and red lentils. This low fat, low GI curry is easy to make and a true taste of India. The overall glycemic index is brought down by the lentils and the chicken, both low GI ingredients. A healthy mouthwatering meal that can be enjoyed at any time. 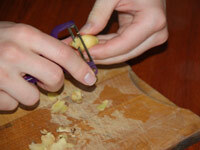 Peel and finely chop half of the ginger and place in a pan with the sliced onions, lentils, turmeric and korma powder. If you like your curries hot then add the sliced green chilli now. 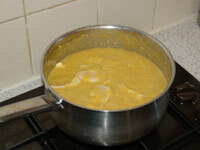 Add 2 pints/1 litre of water to the pan, cover with a lid and bring it to a simmer. Turn the heat right down and leave it to simmer for 40 minutes. Leave the lid very slightly ajar to stop it boiling over. Cut the chicken into small cubes and add to the pan. Cook for another 25 minutes until the meat is done. It is crucial that you remember to stir the pan regularly (every 5-10 minutes) as it is at this stage that it is most likely to burn. 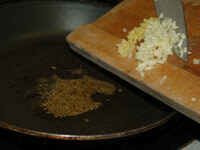 Heat the oil in a frying pan and once hot, fry the whole cumin seeds for 30 seconds. Add the remaining chopped ginger and garlic and fry for a minute more. Add the cayenne pepper in the pan and mix in with the other spices then immediately put the whole lot in main pot. 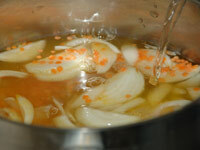 Put the lemon juice, salt, nutmeg and cinnamon in the main pot and cook for another 3 minutes. Serve with long grain or basmati rice. If you like a fruity curry then you can add a handful of chopped apricots at the same time as the chicken.